Background: Water treatment, important for maintaining clean water among other applications, is still a challenge to improve remediation technologies for eliminating pollution. Ultrafiltration, as one kind of membrane separation processes which play a vital role in water treatment, has been attracted extensive attention for its merits of high-efficiency, low-cost and energy-saving. However, some drawbacks still restrict the application, including poor hydrophilicity, low permeability and severe membrane fouling. Thus, improving the performances of the ultrafiltration membrane is urgently required. Methods: This paper reviews recent literatures and patents on the synthesis and applications of graphene-based ultrafiltration membranes. The goal in this work is to provide deep insight into the selection of graphene-based materials, structural design and methods of graphene-based mixed-matrix membranes (MMMs) and the substrate supported graphene-based membranes. 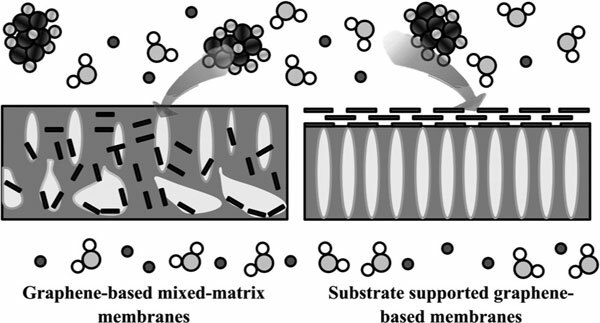 Results: Various drawbacks in traditional ultrafiltration membranes such as obvious protein adsorption, severe membrane fouling and poor hydrophilicity can be reduced through incorporating graphene-based nanomaterials into polymer membranes. It is confirmed by putting forward to some applications in water purification, antibacterial membranes, membrane bioreactors and protein separation. Conclusion: Graphene-based materials introduced into membrane materials have shown that they can effectively increase the permeability, antifouling and antibacterial properties of membranes. In this review, we anticipate to provide a useful insight into the design and synthesis of graphene-based ultrafiltration membranes, and hope that a new avenue can be opened to develop high quality ultrafiltration membranes in separation process. Graphene-based materials, ultrafiltration, membrane separation, water treatment, antibacterial efficiency, pollution.